Greetings from Las Vegas! I flew in from Minneapolis Sunday night and came straight to the hospital. Jane promptly informed me that I was now on blog duty, so an exhausting two days later, I’m here with the next update for you. Emily was making great progress the first couple of days following surgery last Wednesday, but by Saturday a few complications were setting in. She hadn’t eaten or drank anything since the day before because she was experiencing cramping and bloating in her abdomen as well as acid reflux. The doctors decided she should stay another night with plans to go home on Sunday. But by Sunday she wasn’t improving. She was even more bloated and extremely dehydrated, claiming that any time she even tried to take a sip of water she felt the onset of heartburn. Dr. Browder ordered an X-Ray first thing yesterday morning, but because the X-ray was only a one-dimensional view, the doctor then ordered a CAT scan to get a three-dimensional view to determine what was going on. This immediately brought tears to Emily’s eyes knowing she’d have to drink an entire bottle of barium, a liquid used to coat the stomach so the doctors can easily read the CAT scan images. In an attempt to alleviate the mere thought of having to drink 3 cups of fluid, Emily and Jane resorted to playing drinking games. Was this a flashback from the college days, or what?! With a deck of cards, a bottle of berry-flavored barium, and water, the mission was accomplished half an hour later. 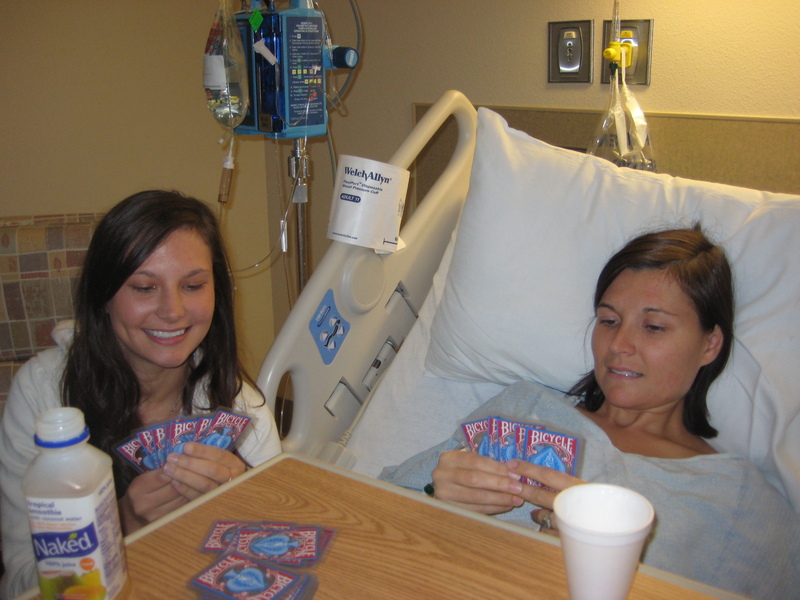 Jane took a few sips of barium herself to help Emily along…..but we somehow failed to mention that part to the nurses. The hard part next was waiting more than two hours for the barium to do its job….on Emily as well as Jane! Then, another two hour wait to get the results from the doctor, which revealed severe blockage. A tube was then inserted into the opening of the stoma (the part of the intestine her bag is hooked up to) and another tube, called an NG tube, up her nose and down her throat into her stomach to pump out more bile. Emily was extremely uncomfortable and had the IV for morphine hooked back up along with another catheter inserted. By this point it had been three days since she had eaten and the mere smell of food made her nauseous. After being at the hospital for 9 hours, we thought we’d let her rest. It is now Tuesday morning and Emily is feeling better. The drainage tubes seemed to be serving their purpose and she has released about a quart of the fluids that were backing her up. She was taken away for another X-Ray of her bladder because the doctor noticed there was air in front of the bladder, and just wanted to make sure everything was working properly. I know Emily will reach her goals…she is truly an inspiration. Please remember that every prayer does count. Em, What an amazing person you are! So upbeat through all this crap, literally and figuratively! And still looking like a hottie too! Saying a prayer for you right now. Remember my sister Nancy? She reads your blog all the time and is thinking of you as well. You’ll have your walking boots on soon Emily, I just know it…! Emily there are days when you must have no songs in your heart but girl you mangage to sing anyway. And, heres to your awesome husband, dedicated sister, fantastic brother and loving parents! Em, Recharge your momentum and battle back. It’s getting into holiday time,you need to celebrate. Our thoughts and prayers are with you. Nobody rocks a colostomy bag like you do, Em!!!! You are all in our thoughts EVERY day! Now – make sure Jane isn’t cheating in cards. Always praying for you Em! I know how frustrating setbacks can be, but you can do this. Just keep looking forward and realize all the progress you have made already! You are one amazing woman and we all love you so much! U will be home soon!!!! I gotta tell you how much I admire you. We are just work friends and new ones at that…but your confidence and focus even with all the other things going on is truly remarkable and has made such an impression on me. The Department is doing just fine, thanks to you preparation…but we wantcha back soon. OK? All of our thoughts and love are being thrown towards Vegas, always. We love you Em, and the whole Ihrke family!